July 2nd, 2015 05:43 PM | by William Bell | Eschatology. What is it all about? Some claim that Paul’s writings are a kind of stumbling block or test to prove whether believers would walk in the Law of Moses. Because Paul’s writings appear to teach things “contrary to the law” which they don’t, it is concluded that he is an inferior Apostle. 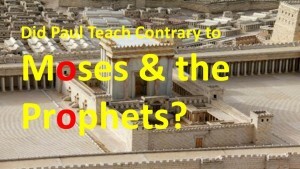 In a video titled, The Truth of “Paul the Benjamite” various arguments are presented to discredit Paul. This is not intended to prove the validity of Paul’s writings per se, but rather to demonstrate that there are no contradictions between Paul and Moses. The claim that Hebrews or Israel was sent on slave ships to America following the 70AD Roman invasion of Judea is the engine driving these views. It is an attempt to biblically justify the reason Africans were enslaved, not only in America but throughout the world. Those in America are claimed to be the tribe of Judah in many cases. You can flip through the slides below to follow along with the video. A key text in claiming Africans as Hebrew slaves of the diaspora who will be gathered back to their land is Deut. 28:68, a text from the Torah. This is not discussed in this study, but it is important to know why the attempt is made to discredit the writings of Paul. The problem with this teaching is that it ignores the terminus of national Israel, found not only in the writings of Paul, but also in those of Yeshua, (Jesus, the Christ), Peter, James, Jude and John. So no apostle agrees with a continuation of the national kingdom of Judah. In fact, God gave Judah a bill of divorce as he had done to her sister Israel for the same reasons, idolatry and immorality. That is the meaning and message of the Book of Revelation.